There's a lingering stereotype about brussels sprouts that says they're mushy, funky, and to be avoided. Not so! 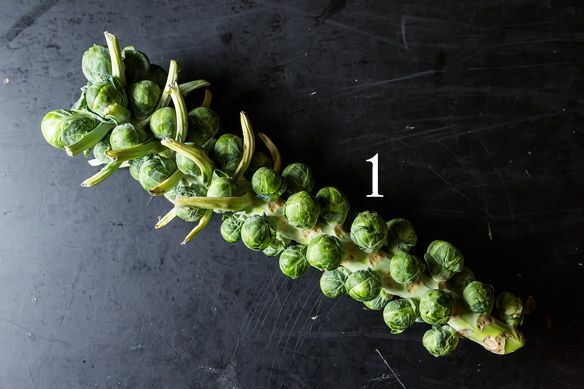 Brussels sprouts, which originated in Northern Europe in the 13th century or so, are actually the greatest of all brassicas: they have cabbage's vegetal sweetness, kale's versatility, cauliflower's nuttiness, and more surface area (which equals more potential crispiness) than just about any other vegetable. 1. Baseball Bat: Yes, this is what a stalk of brussels sprouts looks like! (If you've ever seen a kale plant, which has leaves coming off a thick central stem, this will be familiar.) 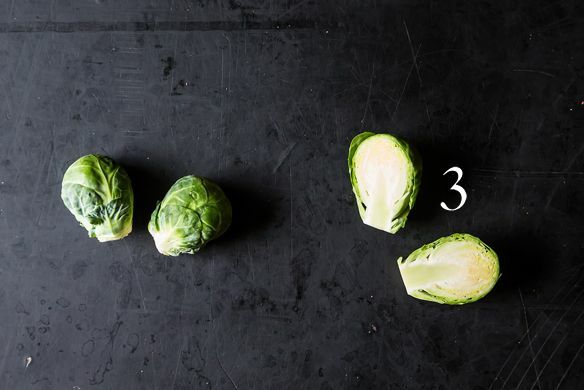 The sprouts reach maturity from the bottom up -- in fact, you can harvest sprouts from the bottom and the stalk will keep growing on top, which means you'll have brussels sprouts all season long. When the stalk reaches 2 feet or so in length, it's customary to "top" them by pinching off the top-most sprouts. This forces the stalk to put its energy into developing its existing sprouts instead of growing new ones it may not be able to support before the frost. 3. 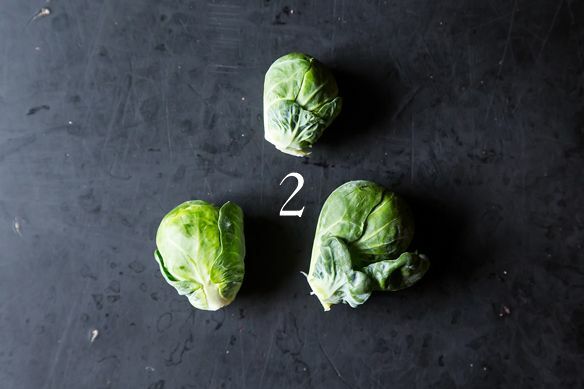 Core of the Matter: To increase surface area and allow for more even cooking, it's best to halve sprouts; whole ones can get mushy in the middle despite their crisp exteriors. No need to cut out that core as you would for a cabbage -- it's tender and quick to cook. 4. 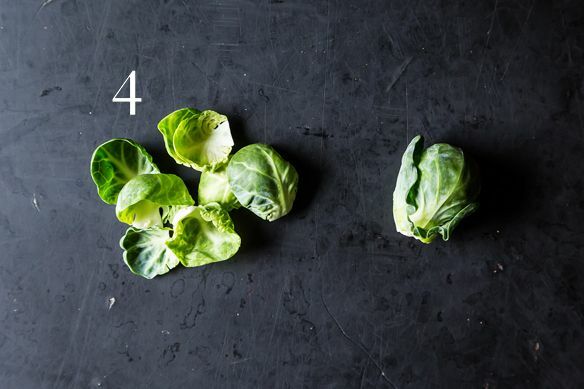 In the Raw: Of course, you don't have to cook your sprouts at all! The loosened leaves make for a great slaw. Keep in mind though, that the delicate leaves wilt quickly under acidic dressings -- dress raw brussels sprouts salads just before serving. Versatile and delicious, there are dozens of Food52 recipes for brussels sprouts -- so many that you could try a new preparation every meal for days: deep-fried, glazed, shredded, and even grilled. What's your favorite way to cook brussels sprouts? I love making a cream soup with brussel sprouts. Something like the zuppa toscana with steamed and quartered brussel sprouts added in place of the kale is one of my favorites. A friend made my husband and I brussel sprouts, saute'ed them in 1/2 olive oil, 1/2 butter, just enough, not too much. Right before they were done he sprinkled them with brown sugar. They were delicious! I've never heard of pinching the topmost sprouts on a stem so that the plant puts energy into the remaining sprouts. It's true that one removes all but the topmost leaves for that purpose, although not so that the sprouts mature before frost. Brussel sprouts, like cabbage and other brassicas, aren't affected by frost. They thrive in cold fall weather, becoming sweeter and tastier then. Sprouts will continue to ripen up the stem until the beginning of winter. I picked my last sprouts from a Maine garden during the first week in December. Luckily for me I never tasted Brussels sprouts until adulthood and I love them! I make them often, either sautéed in bacon drippings or roasted with just a bit of oil and kosher salt in an attempt to turn Brussels sprouts haters into lovers and so far have succeeded every time. Very sad that most people have only tried mushy, bitter Brussels spouts. Oh man, now I'm craving these. I'll have to keep on the lookout for Rubine variety. That sounds beautiful. Cut in half, sprinkle with olive oil, salt & pepper and roast in a 400 degree oven for 20 minutes ... Yum! My husband also thought he didn't like brussel sprouts ... until he tasted these! My husband thought he didn't like sprouts until he met me! Cut in half, steam, and toss with a flavored butter or dressing and roasted nuts of your choice (our favorite nut is pecan). Easy peasy. My husband slices the sprouts and cooks them in a wok with caramelized onion and a little garlic. When they are slightly brown on the edges, he adds a few shakes of balsamic vinegar, and they are just great. I used to make a Martha Stewart recipe in which the pureed, cooked inner leaves are spun with cream in a Cuisinart and decorated with the bright green outer leaves. Very tasty and attractive but the healthy properties of the sprouts are extinguished by the cream. The above version is better for you and really better tasting. My family has always loved brussels sprouts, maybe because my mother avoided cooking them until they were dead. Brussel sprouts are such a delight! Hard to imagine why anyone wouldn't want to have these brilliant veggie nuggets. 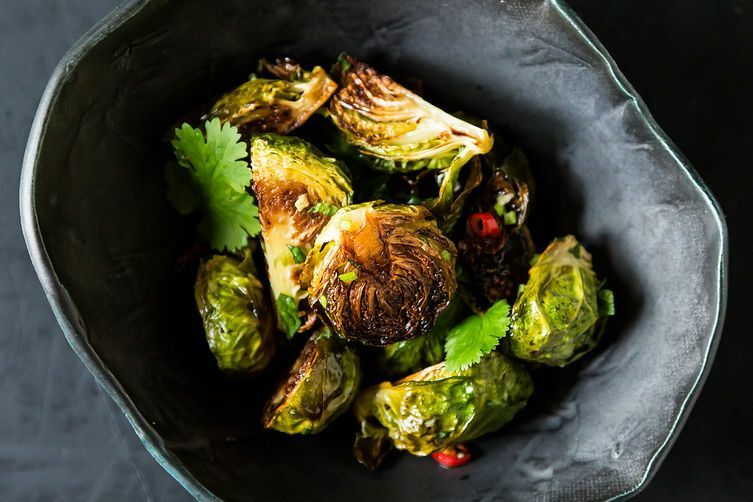 The very best brussels sprouts recipe that I have tried is from Yotam Otolenghi's PLENTY. Wow. I just cut the oil in 1/2. (Yotam loves oil.) Otherwise, cook as directed in his brussels sprouts with tofu. I love buying the big branches of sprouts from the farmers market! I always look forward for it so I can make the momofuku brussel sprouts recipe! Store Brussels are often not as sweet as they should be because they need frost in order to reach full flavor and most store Brussels come from minimal frost growing areas. Roasting, with lots of sliced garlic and some olive oil (no EVOO needed, the plain stuff is better for this) brings out their flavor best, especially if you let the outer leaves caramelize a bit.